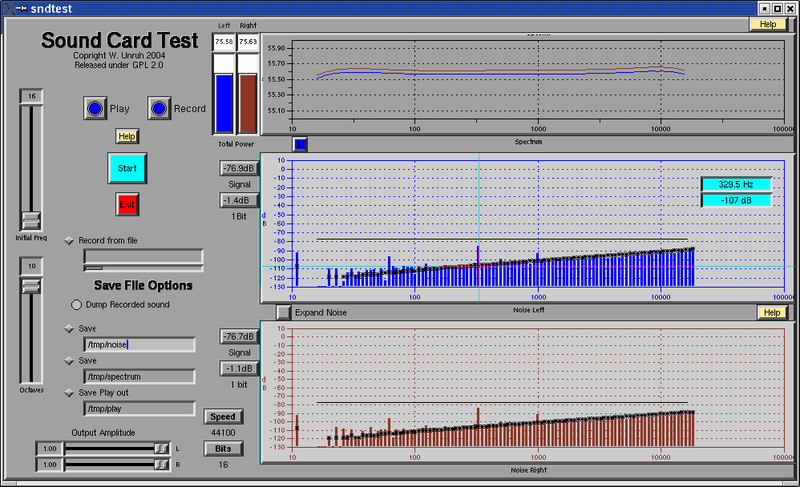 The program xsndtest (version .17) designed for testing and finding the optimum settings for your sound card. Unfortunately it at present works automatically with the oss (emulation) /dev/dsp sound card port, and will only test at 16 bits resolution-- it can be used to test 24 bit card performance and alsa drivers as well with slightly more work. See the section Alsa below. The program works in its simplest form by playing out the output port of the sound card, while at the same time recording the same signal through the input port of the card. Thus the card needs to be capable of full duplex (record and play) operation for this simplest procedure to work. However, it can also be used just as the source for the desired test signal to be delivered out the output port to another system, or as the recorder of such a signal from another computer or sound source. The recorded sound is analysed, both to see if the soundcard has preserved the amplitudes of these frequencies, and to see if it has introduced any extra sounds (noise or distortion). This is a relatively severe test of the card, much more severe that the usual harmonic and IM distortion tests, but also comes closer to the structure of real music, and the distortions and noise introduced by the card into real music. The key limitation is that the system must operate in loopback configuration, so that it tests a combination of the output DAC and amplifier and the input ADC and amplifier combined. Thus a great output could be hidden behind a poor performance of the recording section of the card. Of course if you have two cards, one of which is fantastic, it can be used as the source of the signal, to test the input behaviour of the card under test, and as the test of the output of the card under test. Many sound cards seem to direct the input coming into either Line In or Microphone directly back into the output. This will cause feedback in this test. On the two cards I have tested, this can be eliminated by an appropriate setting of the mixer controls (eg in aumix or alsamixer). If you are using the Line input, choose the Line as the input (ie red dot) in aumix, but pull the Line slider all the way to zero. This slider seems to control only the sound level delivered directly from the input to the output, and not the sound level delivered to the /dev/dsp input. Control the input volume to /dev/dsp with the IGain slider. You can get an idea both the input and output of the sound card by watching what happens to the noise figures as the amplitude sliders (eg using aumix) are adjusted. Pull down the output slider (ie the PCM slider) to about the half way mark. Adjust the input IGain slider to find the lowest value of the total distortion. Now turn up the output (PGM) until the distortion suddenly rises. (Make sure that the Max value of the signal never reaches 1 or -1-- the signal level slider will turn red. Pull down the IGain if necessary to keep it below clipping). This value of PGM is the clipping level of the output. Do not ever have it higher than that level. Now, with the output (PCM) below that clipping level, turn up the input (IGain) until again the distortion begins to rise significantly (again making sure that Max is less than 1.0-- decrease the PCM slider if necessary) . Again, you should never have the input higher than this. This is the layout of the window of the program. On the left are the controls, and on the right are the spectral displays of the response and the noise/distortion of the card. Freq slider--This determines the lowest frequency of the signal sent to the card. This is one of the discrete values corresponding to the 100 discrete frequencies produced (ie 10 equally spaced pitches per octave, and 10 octaves). If this is adjusted the octave slider is always also adjusted to ensure that the top frequency never exceeds 20KHz. Octave slider--This slider determines the number of octaves (1-10) of pitches covered by the test tones. This is always a whole number and is always adjusted to that the maximum frequency never exceeds 20KHz. For most purposes these two sliders can simply be left in their default position. Play-- This button determines whether a signal is sent out by the program to the soundcard. If it is blue, does send out a signal. Record-- This determines whether the program records a signal, either from the soundcard or from a file, and analyses that signal. The analysis proceeds by the program taking 1 second worth of material and performing a Fourier analysis of that material. At each of the frequencies as determined by the Initial Freq and the Octaves sliders (ie 100 frequencies by default) the power in the recorded signal is determined and plotted in the top graph on the right. The power at the other frequencies, which is a combination of the noise and distortion is plotted for the right and left channels on the lower two graphs on the right. Start-- This starts the test and sends out the signal, records the signal and analyses it depending on the other settings. It will remain depressed during the course of the test. The test lasts for two seconds plus whatever the analysis and plotting time take. Record from file-- This button determines whether or not the program records and analyses the sound from the soundcard or the sound stored in a file. The file is assumed to be a raw stereo file, with the speed and the bits per sample as determined by the selectors described below. (The 24L and 24H selectors are assumed to be 24 bit samples packed into 32 bits, with either the bits packed into the lower or higher bytes of the 32 bits. The highest or lowest byte is assumed to be zero. The name of the file must be typed into the input region. If the file is longer than 2 sec of data, the slider below the file name input region can be used to select from which part of the file the 1 sec sample will be taken. Note that when this option is selected, the Play option is canceled, since it makes no sense to play through the soundcard while reading and analysing from a file. Dump Recorded Sound.-- Two seconds of the recorded input is dumped, as a raw file at the speed and bits format selected, to the file /tmp/record. This could be done to save some particular piece of unusual analysed result. This must be pressed after the Start button is pressed with a sample in memory to be saved. It is rarely of much use. Save Noise-- And ascii file containing the values plotted in the noise spectra is printed out to the file in the box (/tmp/noise by default). This must be pressed before the Start button is pressed for the saving to take place. Save spectrum-- And ascii file of the levels of the recorded signal at each of the selected frequencies is saved, together with a rough estimate of the noise in each channel. Again the file used is typed in by the user, with /tmp/spectrum as the default. This button must be pressed before the start button to be effective. Output Amplitude-- This changes the amplitude of the signal created for sending to the soundcard. Usually the signal is the maximum possible value, so that one of the samples has a value of 2^15 or 2^23 depending on the bits selected. Sliding these sliders to the left reduces this maximum value. Note that this is not the same as a volume control as the digitisation level changes when this slider is used. Eg, if these are slid to the halfway point, then only 15 bits would be used in the digitized signal rather than all 16, increasing the digitization noise in the output. However these can be used to for example send a signal only out the left or right channel of the soundcard to look for crosstalk between the channels. Speed-- This allows one to choose one of the three speeds-- 44100 Hz( the standard for CDs), 48000Hz (a common soundcard frequency-- Creative labs soundcards tend to support only this speed) and 96000Hz, the high resolution speed, used on DVD sound. Bits-- This allows the choice of how many bits each sample is encoded in. 16 bits corresponds to two bytes per sample, and is the CD standard. The two 24 bit options correspond to the two ways of packing the 24 bits into 32 bits (4 bytes.) The 24L corresponds to packing them into the lower three bytes with the highest byte being zero. This is the format that ALSA uses to pack 24 bits into 4 bytes by default (eg, the S24_LE format). The 24H corresponds to packing the bits into the higher 24 bits of the 32, and corresponds to what sox produces when asked to convert say 16 bits to 32 bits. Spectrum-- This plots the energy contained in the selected discrete frequencies created by the program in the test signal. Both the right and left channels are plotted. The scale is adapted to the L or R channel depending on the state of the LR button (below). The left channel is plotted in blue, the right in brown. Note that if the two are identical, the brown colour will dominate. LR button--This determines whether the y axis limits are determined by the left or right channel. Noise Left and Right.-- These graphs present the total noise between each of the designated frequencies. Because the frequencies which fit the 1 second sample time are all of the integer frequencies, the number of noise frequencies increase as one goes higher in frequencies. The black crosses indicate the expected noise levels in each of these intervals if there were a constant 1 bit (out of 16) random noise in each time interval. Note that the discretization noise for the 16 bit level is down by about 10dB from this level. The noise levels at the left represent the total noise across the whole spectrum referenced to either the total signal, and to the 1 bit signal level. Expand Noise-- If a noise bar in either the left or right channels is selected by the mouse (and the light blue cursor lines) pressing this button graphs the noise at each frequency in that band in a small graph to the left over the control area. Pressing this button again removes that graph. The graph appears only if there is at least one noise frequency in the interval, and if the frequencies lie between 16Hz and 20KHz. The graph is a bar graph for frequencies below 1KHz and regular graphs over that. Left Minus Right Clicking on the "Noise" button changes the the graphs to give the amplitude difference in eD between the right and left channel, and gives the phase difference between the two channels (in degrees). These will record 4 seconds worth of the sound being piped out the output and into the input which you can then analyse with xsndtest. Just select 16 bits, speed=44100 ( or speed of 48000 for the -f dat case) and use the "record from file" feature, where you select the filename to be /tmp/input-16-44100.raw (or whatever you named it). You can use the small slider under the filename to select the portion of the file you want to analyse. The program will now analyse one second's worth of the sound in the file for you. You can make your own output files as above. will concatenate two copies of file1 into file2. If file1 is your saved play output, then file2 will contain double the time worth of output. You should make sure that you have at least 8 sec worth of material to play. Copyright W. G. Unruh 2003,2004,2005. Please send any comments to . This document may be reproduced as long as the author's name is not removed, and as long as any changes to the document are clearly marked as such and are sent to the author.